This XTX100 incorporates a new front cover design manufactured using high strength materials that protect the most vulnerable part of the demand valve. Quality chrome plated metallic features immediately identify this regulator as a top of the range model. The purge operation has improved beyond that of its predecessor. The original XTX100 improved on the purge itself. Due to the open design the purge was self clearing and prevented debris build-up. All this is still evident in the new model but with added benefits. The new purge button is larger for easier use and now also offers a dual flow rate purge. The Venturi Lever of the XTX100 was designed to reduce the amount of grit ingress which resists friction and offers a smooth operation. The new XTX100 lever has improved ergonomics for even easier use and of course still operates very smoothly. 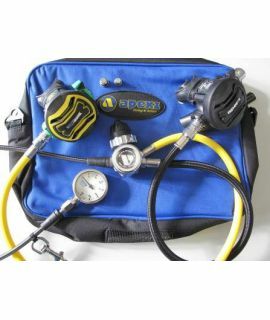 The XTX100 can be converted from a right handed hose configuration (as supplied from the APEKS factory in the standard) to a left handed one. This feature is known as the Reversible Venturi System (RVS). Changing the regulator to a left handed configuration is both quick and simple and can be performed by any APEKS Authorised Service Technician. The 2nd stage of the XTX100 features our Diver Changeable Exhaust system (DCE) giving divers the ability to change from a small to a large exhaust tee.
. A swivel hose connection is available at an extra cost. 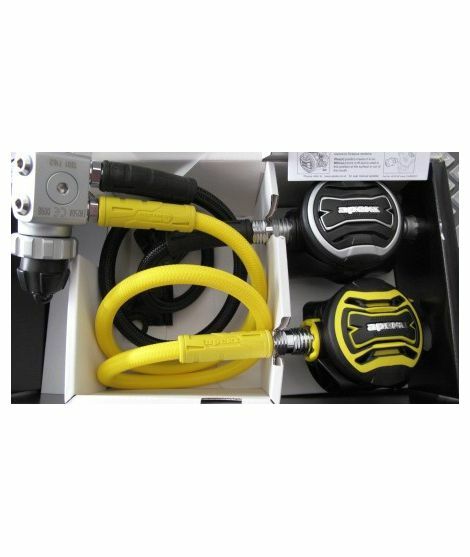 This allows the demand valve end of the hose connection to rotate and pivot, providing even more comfort. A silicone exhaust valve has been used on the XTX100 regulator improving breathing performance. 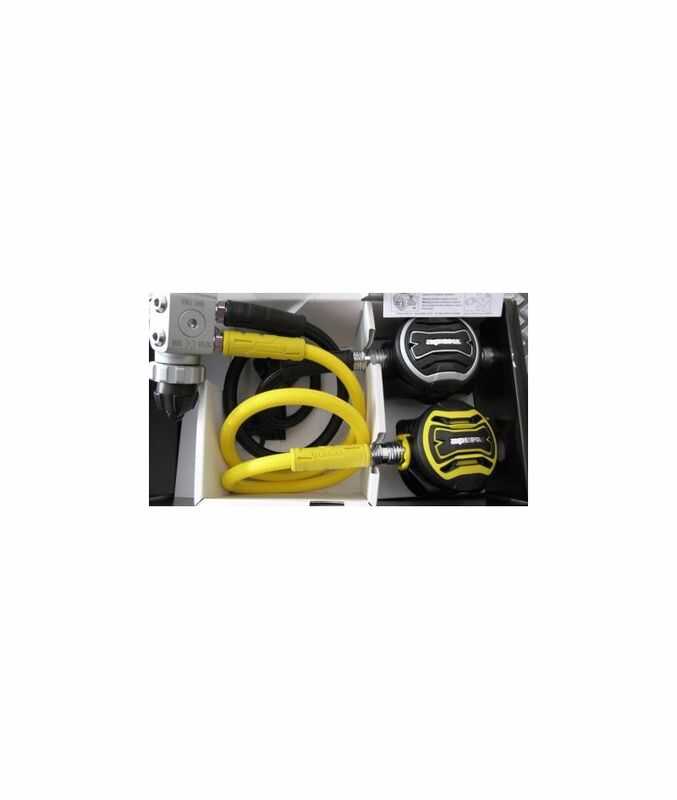 Here we have the new XTX100 Set 2013 with Oktopus XTX40, Flexhoses, Mainregulator 74cm hose black, Oktopushose yellow 90cm. &#1054;&#1095;&#1077;&#1085;&#1100; &#1093;&#1086;&#1088;&#1086;&#1096;&#1077;&#1077; &#1086;&#1073;&#1089;&#1083;&#1091;&#1078;&#1080;&#1074;&#1072;&#1085;&#1080;&#1077;, &#1086;&#1090;&#1079;&#1099;&#1074;&#1095;&#1080;&#1074;&#1099;&#1081; &#1087;&#1077;&#1088;&#1089;&#1086;&#1085;&#1072;&#1083;, &#1086;&#1087;&#1077;&#1088;&#1072;&#1090;&#1080;&#1074;&#1085;&#1086; &#1088;&#1077;&#1072;&#1075;&#1080;&#1088;&#1091;&#1102;&#1097;&#1080;&#1081; &#1085;&#1072; &#1074;&#1089;&#1077; &#1087;&#1088;&#1086;&#1073;&#1083;&#1077;&#1084;&#1099; &#1087;&#1086;&#1082;&#1091;&#1087;&#1072;&#1090;&#1077;&#1083;&#1103;. &#1050; &#1089;&#1086;&#1078;&#1072;&#1083;&#1077;&#1085;&#1080;&#1102;, &#1087;&#1086;&#1095;&#1077;&#1084;&#1091;-&#1090;&#1086; &#1085;&#1077;&#1074;&#1086;&#1079;&#1084;&#1086;&#1078;&#1085;&#1086; &#1086;&#1087;&#1083;&#1072;&#1090;&#1080;&#1090;&#1100; &#1080;&#1079; &#1056;&#1086;&#1089;&#1089;&#1080;&#1080; &#1095;&#1077;&#1088;&#1077;&#1079; &#1089;&#1072;&#1081;&#1090; &#1087;&#1086; &#1082;&#1088;&#1077;&#1076;&#1080;&#1090;&#1085;&#1086;&#1081; &#1082;&#1072;&#1088;&#1090;&#1077; &#1089; &#1087;&#1086;&#1084;&#1086;&#1097;&#1100;&#1102; CVV2. &#1042; &#1101;&#1090;&#1086;&#1084; &#1089;&#1083;&#1091;&#1095;&#1072;&#1077; &#1087;&#1088;&#1086;&#1094;&#1077;&#1076;&#1091;&#1088;&#1072; &#1087;&#1086;&#1082;&#1091;&#1087;&#1082;&#1080; &#1079;&#1085;&#1072;&#1095;&#1080;&#1090;&#1077;&#1083;&#1100;&#1085;&#1086; &#1091;&#1087;&#1088;&#1086;&#1089;&#1090;&#1080;&#1083;&#1072;&#1089;&#1100;, &#1072; &#1080;&#1079;&#1076;&#1077;&#1088;&#1078;&#1082;&#1080; &#1087;&#1086;&#1082;&#1091;&#1087;&#1072;&#1090;&#1077;&#1083;&#1103; - &#1089;&#1085;&#1080;&#1079;&#1080;&#1083;&#1080;&#1089;&#1100;. Very good service, responsive staff, promptly reacts to all problems of buyer. Unfortunately, somehow it is impossible pay out of Russia through the website by credit card with using the CVV2. In this case process of buying would greatly simplify and cost of the buyer - declined.